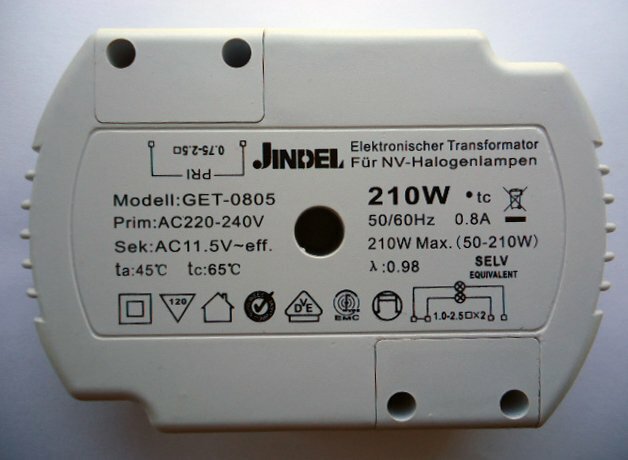 Jindel are one of the most popular Chinese electronic brands producing top quality electronic transformers in the world. Jindel are producing some of the smallest 12v electronic transformers currently available on the market. Their fantastic innovative design means these can be installed in the most smallest of lighting luminaire housings or where space is at a premium. This is a twin 12 volt output 210w transformer. Model: GET0805 Input: 220 - 240v Secondary: 11.5v Output: 210w 1. Features short circuit and overloading protection. 2. Wide voltage working between 176V to 253V. 3. Can work in temperatures as low as -20 degrees VDE & RoHs Certifcate Approved.